A Monthly Magazine Devoted to the Living of the New Life. London, England. Publisher: New Life Center. Editor: Orlando Edgar Miller. 1914-1915. 48 pp., 5s. a year. This was a product of the New Life Centre / New Education University Centre in London, a New Thought venture of Orlando Edgar Miller and Paul Tyner. The Centre featured regular services on Sundays, with talks by the principals. The journal was very high-toned and intellectual in its approach and seems not to have prospered. 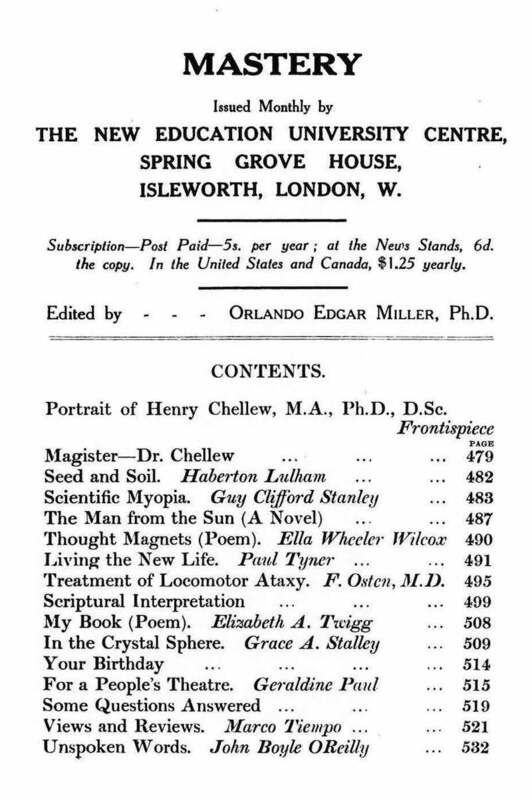 In addition to the Centre, Miller had a Healing Home business (a New Thought sanitarium), the Miller Institute, advertised in the journal, and a Rellimeo Film Syndicate, whose stock he touted and offered for sale. He also used the name "Rellimeo" as the pseudonym under which he wrote several of his books. NYPL; University of Cambridge.